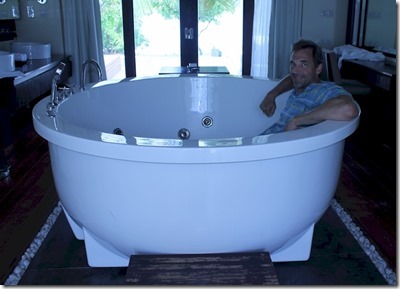 If size does matter to you, then the Zitahli Kudafunafaru tub is the soak for you. Not just wide, but deep. At nearly 2 metres, I am not a small guy and I could barely keep my head above water. It was like a little indoor swimming pool (small children could do laps in this pool). It’s all part of the Kudafunafaru expansiveness. The villas a quite substantial for their relatively modest 4.5 rack rates (the resort is in the top 5 for lowest cost per square metre in the 4.5 star category). 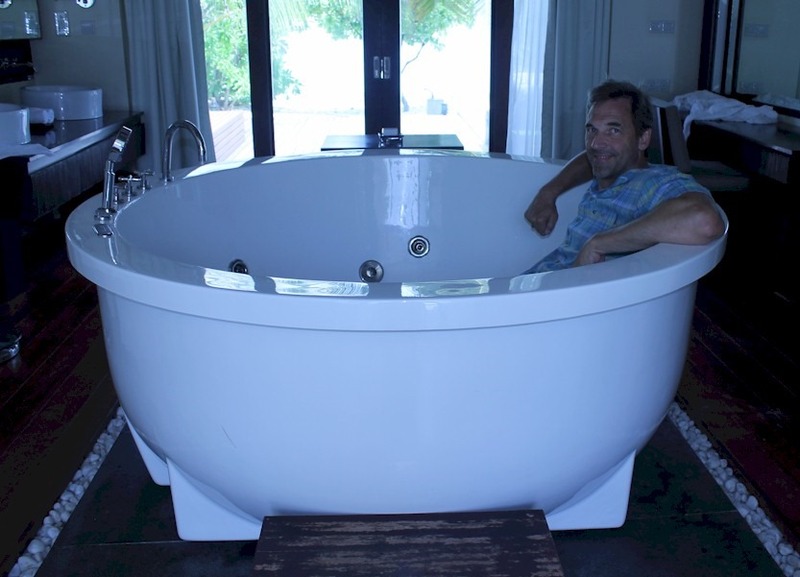 Like a giant ceramic caldron to simmer away whatever the stresses remain after a day of lounging in the Maldivian sun. 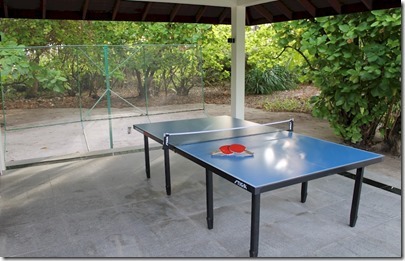 A more practical consideration to table tennis pavilions is chasing the darn ball. Especially in the hard surface areas where it’s extra bounciness means it just keeps bouncing and bouncing as you go chasing it. When we set up a ping-pong table in our garage we rigged up and bunch of flat boxes to provide a back-stop to either side of the table to reduce such frenetic chases (and occasional lost balls). Zitahli Kudafunafaru has provided a more sophisticated solutions with netting on either side of its top quality table. It let’s the light and air through, but keeps ping-pong balls under control. Winner and new champion of the hotly contested bed decorating. 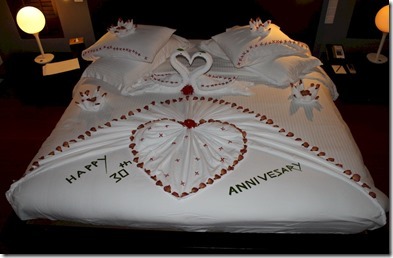 Custom room greeting décor has become such an extreme art form in the Maldives, I started a Pinterest page a while back to showcase the best I came across. 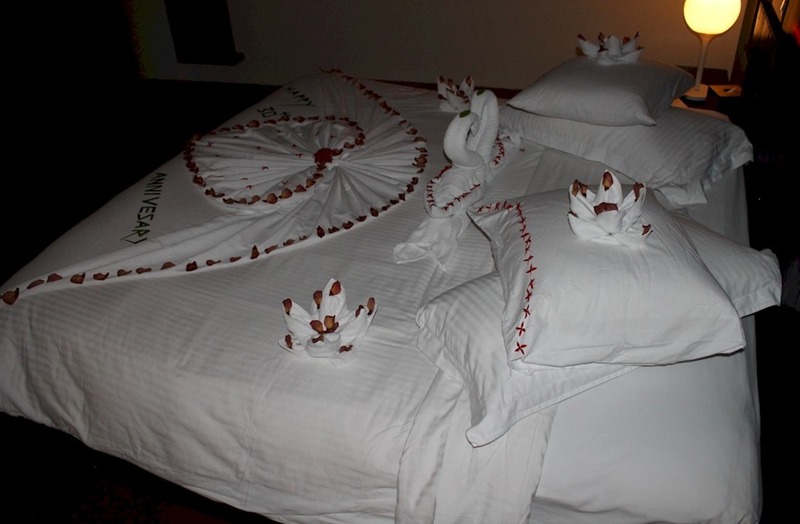 Bed Decoration – The original classic involving flower petals, sheet folding and palm fronds (mostly for spelling out greetings). Towel Art – Folding towels into various sculpture. 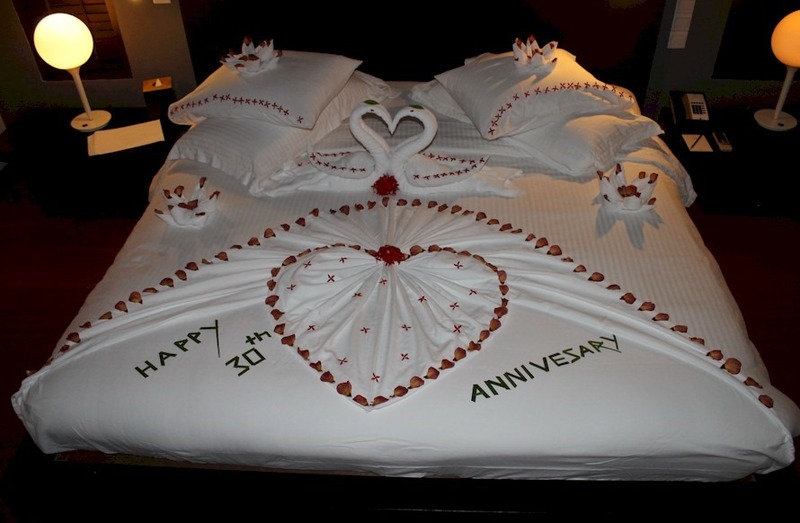 Zitahli Kudafunfaru has set the new bar with its “Happy Anniversary” extravaganza which elegantly combined both. Mind you it was a particularly special one (30th). The only downside is that is was so beautiful that we were tempted to sleep on the sofa so as not to disturb it. Gorgeous. Sometimes good things do come in big packages. Big resort, big villas, big common areas, big house reef, big (well, gargantuan) beach. The key thing that is not big about Zitahli Kdafunafaru is the price. Actually, the island itself is moderately sized (250m x 750m). And a massive chunk of that is its expansive soft, white sand beach (Fun fact – the sand bank at the tip of the island “wags like a tail” as the monsoon currents shift its position around). The resort can keep the individual scale generous because it has built a relative modest number of 50 villas on the island. A serious 5-star property that ticks all the boxes of well-appointed comfort and service, but a contender for one of the best value 5-stars in the Maldives (Kudafunafaru has 2 of the best 10 prices per square foot among 5 star properties). In many respects, Kudafunafaru is the answer to many UK Maldives veterans’ lamentations. I read countless complaints about Maldives crowded dive sites, noisy motorised water sports, small beaches, unaffordable prices and fussily posh styling. Kudafunafaru doesn’t have any of that. 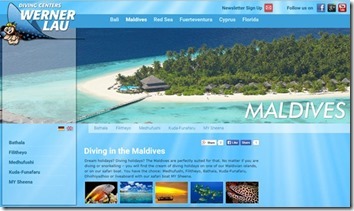 What it does have is the 6th lowest guest population density of a dedicated resort island in the Maldives. In fact, it’s remote location, low guest population density and lack of motorised waters ports makes it a contender for one of the quietest and the most peaceful resort in the Maldives. The voluminous scale doesn’t stop at the water’s edge. We’ve not seen table coral this big since Bandos. The house reef extends for a long way, but it really does require either a strong snorkeler or guided assistance as it is quite a ways out and in relatively deep water. 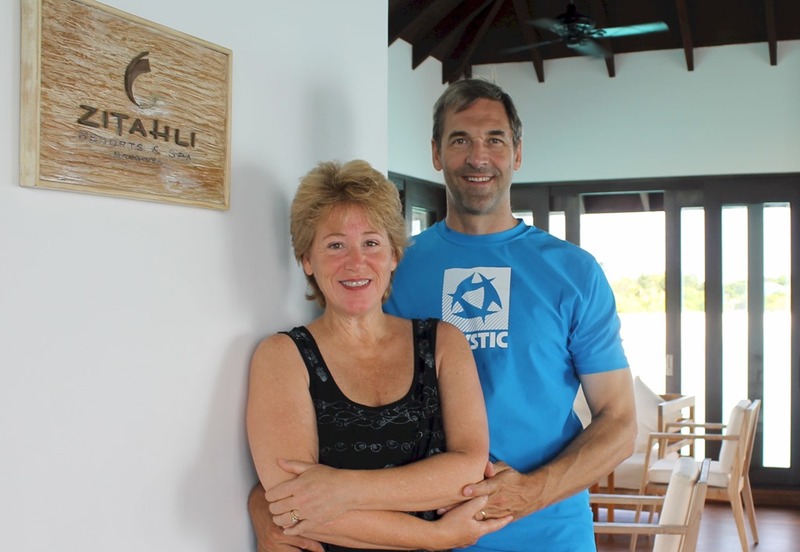 Or you can go even further out and sample one of the dozens of untouched dive sites of the Noonu atoll with their Werner Lau dive master, Julie. We asked for Ribbon Eels and she delivered Ribbon Eels. Four in fact – 3 juveniles and a blue male with a yellow stripe (QI feature to follow on this amazing creature). Kudafunafaru makes a big impression on everything but your wallet. When describing my motivations for adding a Dive Site database to Maldives Complete, I noted the lack of interactive guides. Most diving information is traditional hard-copy book form or magazine websites that provide articles and overviews, but not a structured, interactive resource. The exception to this standard approach is the Werner Lau dive centre website. They have cleverly integrated a mapping of the dive sites near their centres with Google Maps to provide an interactive layout of all of the dives sites local to their 4 Maldives dive centres. You can scan the area for websites who have ToolTip annotations and then simply click on their names to take you to a full profile of the dive site complete with dive chart.